There comes a threshold of chronic flooding that makes normal routines impossible and forces communities to make difficult, often costly choices. Explore interactive maps of affected US coastal communities for all time frames and sea level rise scenarios included in the analysis. If saltwater regularly soaked your basement or first floor, kept you from getting to work, or damaged your car, how often would it have to happen before you began looking for a new place to call home? This national analysis identifies when US coastal communities will face a level of disruptive flooding that affects people's homes, daily routines, and livelihoods. It identifies hundreds of communities that will face chronic inundation and possible retreat over the coming decades as sea levels rise. The findings highlight what’s at stake in our fight to address sea level rise and global warming. They also provide affected communities a measure of how much time they have to prepare. Listen to an interview with senior analyst Erika Spanger-Siegfried on Got Science? Each community has a threshold for sea level rise and chronic flooding beyond which sustaining normal routines becomes impossible. For this national analysis, that chronic inundation threshold is defined as flooding that occurs 26 times per year (on average, once every other week) or more. Communities where more than 10 percent of usable land exceeds this threshold are deemed chronically inundated. A “high scenario,” in which emissions rise through the end of the century and ice sheets melt faster to yield about 6.5 feet of sea level rise. An “intermediate scenario” that projects carbon emissions peaking around mid-century and about 4 feet of sea level rise globally, with ice melting at a moderate rate that increases over time. A “low scenario” that assumes carbon emissions decline steeply and warming is limited to less than 2 degrees Celsius—in line with the primary goal of the Paris Climate Agreement. Sea level rise is driven primarily by ocean warming with very little ice loss. By 2035, about 170 communities—roughly twice as many as today—will face chronic inundation and possible retreat from affected areas under the intermediate or high scenarios, with more than 100 seeing at least a quarter of their land chronically flooded. By 2060, about 270 communities will face chronic inundation with intermediate sea level rise. This number jumps to 360 under the high scenario. About 40 percent of chronically inundated communities in either scenario would see at least half of their land flooded. By 2100, about 490 communities—including roughly 40 percent of all oceanfront communities on the East and Gulf Coasts—will face chronic inundation and possible retreat with intermediate sea level rise, with nearly 300 seeing at least a quarter of their land chronically flooded. The number of communities jumps to about 670—including roughly 60 percent of all oceanfront communities on the East and Gulf Coasts—under the high scenario. If we act today to achieve the temperature and emissions reductions goals outlined in the Paris Climate Agreement, and succeed in slowing the acceleration of sea level rise, about 380 communities could avoid chronic inundation this century. The solutions that can help protect individual communities from increased flooding fall into three broad categories: defending against the sea, accommodating rising water, and retreating from flood-prone areas. In practice, many communities will seek to combine these approaches. Not all approaches will work everywhere. Many are costly to sustain, and rising seas may simply preclude some options. Robust federal and state-level policies and resources will be vital to help communities understand their risks, assess their choices, and implement adaptation plans. To effectively prepare, the country must take bold measures commensurate with the scale of the coastal risks. As we look ahead to the end of this century, we have a choice. If we take aggressive action to address climate change, and succeed in slowing the acceleration of sea level rise, many communities—nearly 400 identified by this analysis—could avoid chronic inundation this century. If, however, sea levels rise along the high scenario, those communities face the risk of chronic inundation by 2100. At this crossroads, reducing global warming emissions must be a national priority. The US can still make deep cuts in heat-trapping emissions and contribute to global efforts to limit climate change. We can still avoid some of the most serious human consequences and losses that our coasts face this century. We have time to respond. We must use it wisely. The methodology and assumptions used for this analysis are published in the peer-reviewed journal, Elementa. Download the PDF. For additional information, please see the full report. 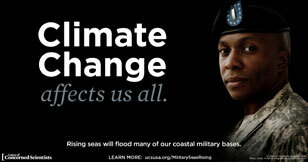 Rising seas will flood many of our coastal military bases.